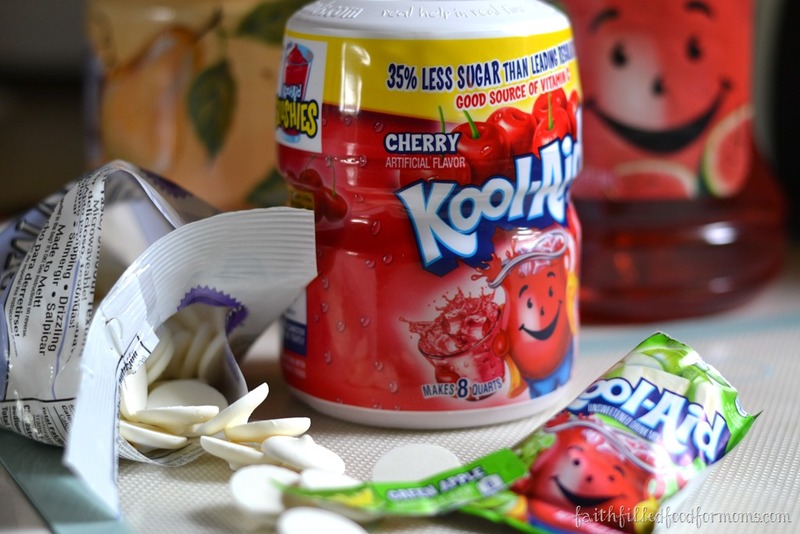 I have created recipes and crafts with Kool-Aid fruit juice drinks forever! 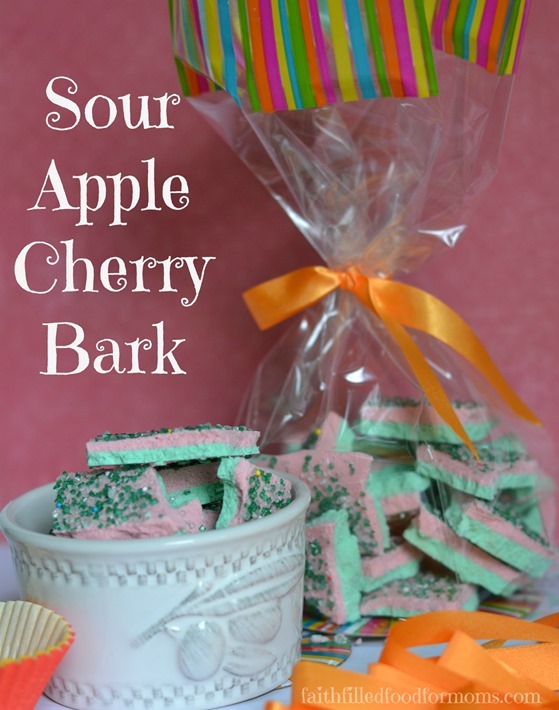 I created this yummy and easy Sour Apple Cherry Candy Bark with Kool Aid…Reason…price, selection of flavors, taste and convenience! Just when I thought Kool-Aid couldn’t get easier, they’ve come up with a convenient and modestly priced new juice drink that is pre-made and ready to roll! No muss, no fuss..just open and serve.. Yay! (think summer, picnics, beach, parties!) Perfect to with! My kids can eat me out of house and home!! Not just MY kids either..we constantly have a stream of teens coming in and out of our home. I guess that is the blessing of living so close to their schools! 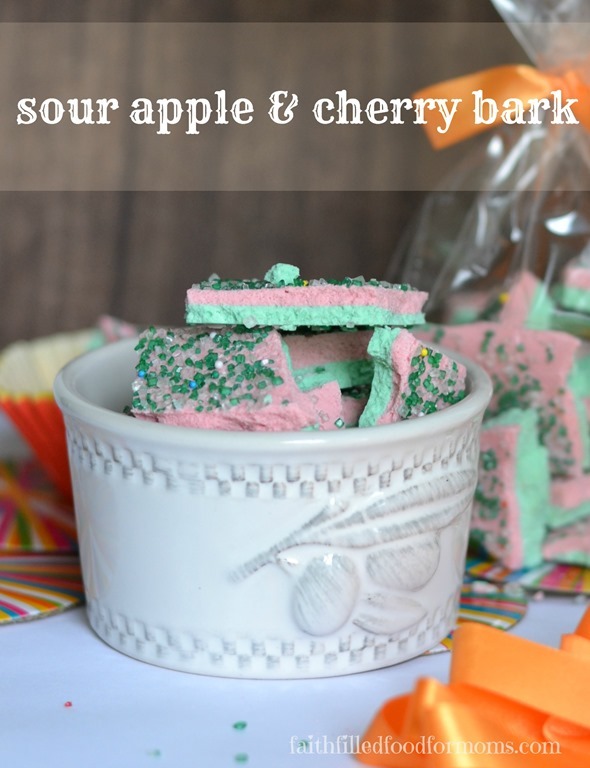 So I am continually trying to create new and fun treats and foods for them to snack on…so using Kool-Aid juice drink, I’ve come up with this fun candy bark and it is deeelish! A total thumbs up from the kids..well and adults too if you LOVE sour and sweet all at the same time! Melt one package of Candy Melts in a double boiler. I just make one with two pans..an old one I have around for this kind of thing and then a non stick one for the top..fill bottom pan half way with water and then put other pan on top with Candy Melts. Put onto the stove at low to medium heat..The candies will melt fairly fast. 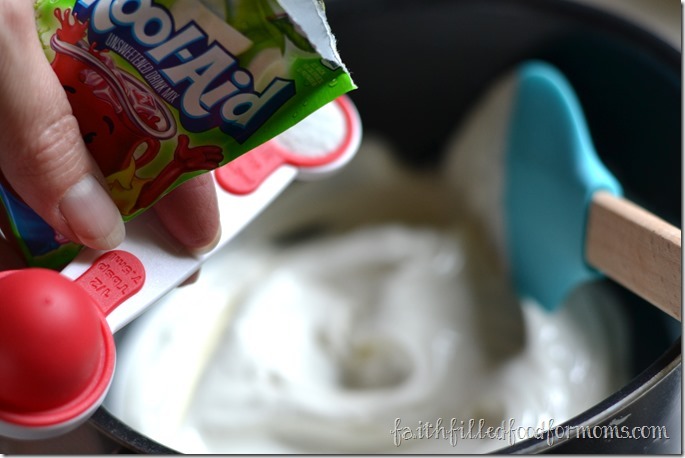 Then pour 2 1/2 teaspoons of the Green Apple Kool-Aid. You may want to do a taste test as to how sour you want this…oh but is soo mouth puckering good!! 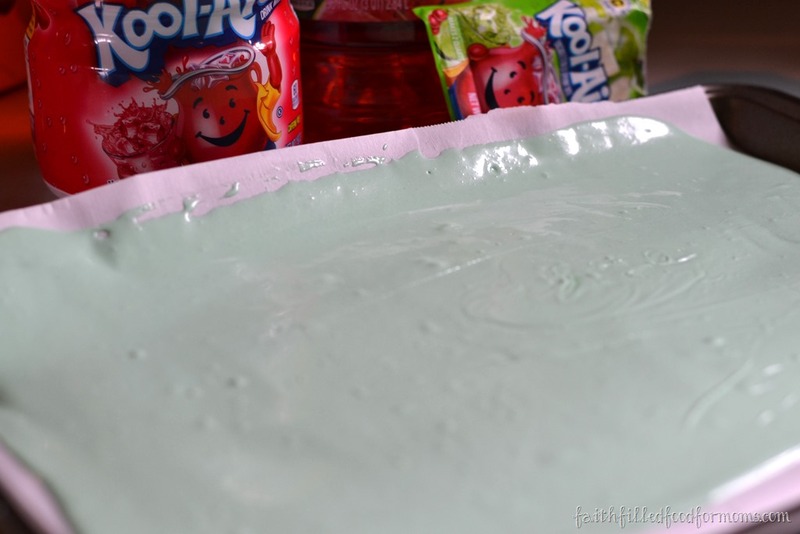 TIP: Now..I didn’t know that Green Apple Kool-Aid didn’t have color so I used green food coloring. If you use food coloring you need to put a little solid vegetable oil into the candy melts to keep it smooth as I found out. You cannot add liquid to Candy Melts or it changes the consistency. So my best tip for this recipe..use colored Candy Melts. Spread the first layer onto a cookie sheet.. While allowing to harden start the next layer by following the exact above directions, BUT..use the Cherry flavored Kool-Aid juice drink. 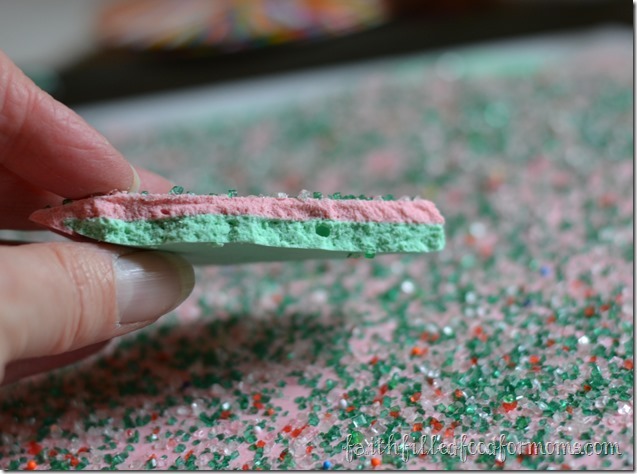 This does turn the Candy Melts a little pink but not much..so same advise…start with pink Candy Melts. 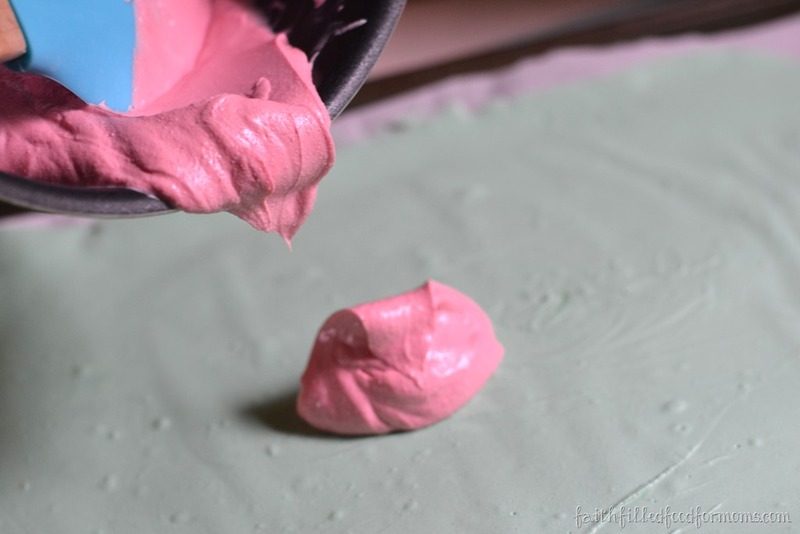 Then spread the pink candy melts on top of the hardened green. You can decorate with topping to your hearts desire! This Sour Apple and Cherry Bark turned out absolutely deeelish! My teens LOVED it and so did their friends..ummm requests for more!! I also hid some for Easter brunch… Everyone loved it! I’d love to know what YOU made with Kool-Aid over the years? Linking up with: Tip Me Tuesday, Twirl and Take a Bow, Titus 2 Tuesday, Titus 2sday, Tasty Tuesday, One Project at a Time, Family Fun Friday, Eat Create Party, Inspire Us Thurs.